While sending kegs eastwards for attendees at the Melbourne and Sydney GABS festivals to sample, Bootleg held enough back to fill 50 cartons worth of bottles for its local market in WA. Said beer is one with GABS beer written all over it: one which starts out as a pretty straightforward affair before being souped up into something else. "The reason behind the Chai is that me and my wife Kelley went on a since forgotten caffeine ending mission last year and we still wanted to go out and have a hot drink so the lesser evil was having a chai latte. I enjoyed the variance in flavour from the different forms of chai out there and wanted to make one for myself. Around the same time I was trying to think up the next edition of beers for GABS 2015 and I have wanted to make a milk stout after hanging out with that Vanilla Milk Stout guy (Craig from Thirsty Crow) and enjoying his beer so much. 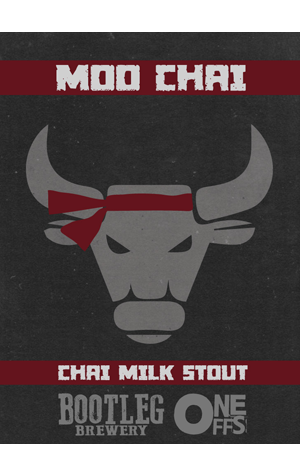 Late one night I just thought why not combine the two ideas and came up with the thought of a Chai Latte Stout..."
What that meant was creating his own chai mix of cinnamon, nutmeg, cloves, black pepper, cardamom and ginger and adding it to the base beer. Et voila: Moo Chai. You can read the full interview on Pia's blog here.